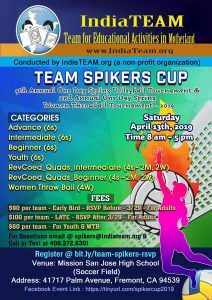 IndiaTEAM is happy to host 9th annual Volleyball and 2nd annual Throwball tournament to raise fund to help schools. Please join the fun event and at the same time to help a great cause. We are looking for event sponsors and volunteers to make this event a grand success. Please reach out to info@indiateam.org, if you could offer help. To play in this tournament, please register @ bit.ly/team-spikers-rsvp. This entry was posted in Spikers Cup, Uncategorized. Bookmark the permalink.